Calvin Mcintosh, 44, (right) was arrested after he brought Alcenti Mcintosh’s neglected and abused body into a hospital in Gwinnett County, Georgia, weighing just 59 pounds. 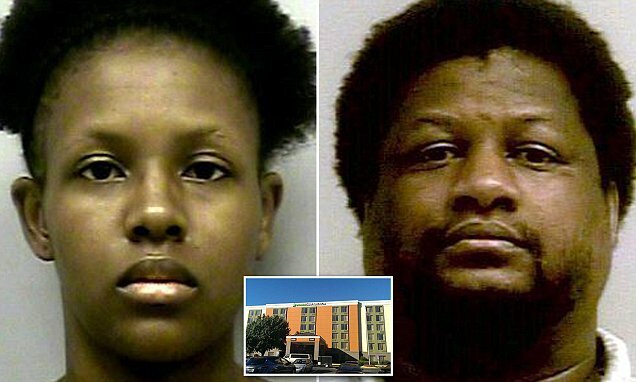 Police then searched his room at the Extended Stay Hotel in Peachtrees Corner (inset) and found three other children, two aged three and one aged five, and her 23-year-old daughter Najlaa Mcintosh (left) – who McIntosh also fathered two children with. McIntosh is said to have ordered Najilaa to deprive the children and Iasia of food if they were disobedient. She has also been charged with multiple offences including murder. Iasia Sweeting, 21, mother of two of McIntosh’s children including Alcenti, was also discovered on the floor of the hotel covered in blankets and in ‘desperate need of medical attention’. During their search, investigators found notes about the Nuwaubian Nation of Moors, an Islam-based cult which mixes ideas of black supremacy with worship of Egyptians and the pyramids.